The unspoilt local environment and mild wet climate is ideal for growing the finest oats. This is the reason why Irish Oats are considered to be the world's best oats in terms of quality and taste. Flahavan's is maintaining the same taste and quality since last 200 years. The milling techniques are handed down over the generations to create perfect porridge oats. Beta-glucan is a soluble fibre found in oats and some other foods. Regular consumption of beta-glucan as part of varied, balanced diet and healthy lifestyle acan contribute to the maintenance of normal blood cholestrol levels. Each serving (30g) contains a quarter of the 3g of beta-glucan suggested per day to help maintain normal cholestrol levels. Taste and enjoy the freshness of Ireland !!! 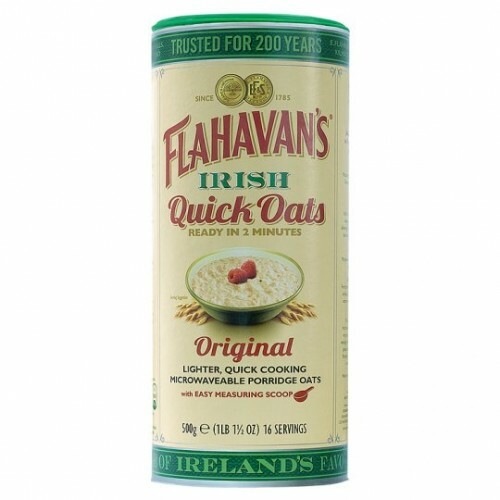 Flahavans Irish Quick Oats - Available in a packing of 500 g, 100% Wholegrain Rolled Oats Ready i..